SUPERTECH Renault F4R Engine Clio Sport 172/182/197/200 Megane 225/230/R26. 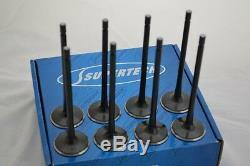 8 pcs of Intake Nitried Valves. Must be used with OEM locks. Brand New directly from Supertech USA TRADE enquires WELCOME. 9:00 - 16:00. The item "SUPERTECH Nitried Intake VALVES Renault Clio Sport 172 197 Megane Sport 225 230" is in sale since Saturday, January 3, 2015. This item is in the category "Vehicle Parts & Accessories\Car Tuning & Styling\Engine, Tuning & Chips\Other Engine Tuning". The seller is "kidzio" and is located in Mroków. This item can be shipped worldwide.